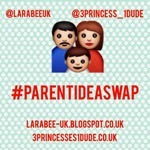 Welcome to the April #parentideaswap this month we're talking 10 minute activities, you know the ones, when you need to get your little ones out of your hair quickly! I must admit I did used to find this a lot easier when T was smaller than it is now. 1. Share an idea on twitter or instagram using the hashtag. 3. Link up your blog posts or instagram photo's here. If you could spread the word too we'd really appreciate it!